SAMSON provides the possibility to generate a template of a SAMSON Element with all necessary classes, which significantly decreases the developing time. This is done thanks to the SAMSON SDK Element Generator provided with the SAMSON SDK. The generated source code immediately compiles, and the compiled SAMSON Element runs as is (although it does not do much yet, and probably not what you would like it to do). Indications, in the form of comments in the source code, guide the development. 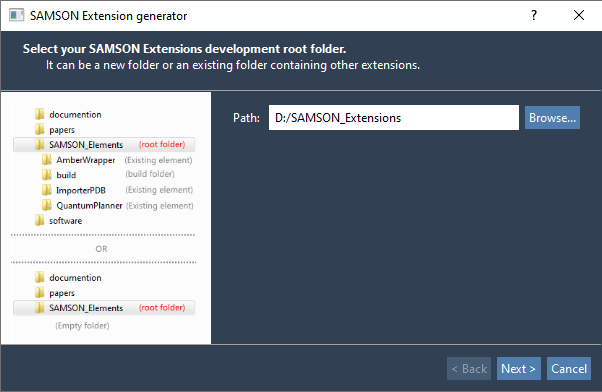 The first page (seen below) lets you enter the path to the folder where you develop SAMSON Elements. For your first SAMSON Element, create an empty folder somewhere and indicate the path to it (hit the Browse... button if necessary). This development folder may be distinct from the folder where SAMSON SDK is stored. When you later create more SAMSON Elements, you may reuse this folder again. For convenience, once specified the path will be retained for the next time you run the SAMSON Element generator. App - a class that may provide any type of functionality. Editor - a class that receives user interaction events (e.g. mouse and keyboard events) from SAMSON, which may be used to provide potentially complex editing functionality. Exporter - a class dedicated to exporting content from the SAMSON data graph to files. Importer - a class dedicated to parsing and importing files. Interaction model - a class responsible for computing energies and forces and is used in SAMSON to perform various modeling and simulation tasks. State updater - a class devoted to implementation of state updaters and is responsible for, e.g., updating positions of atoms. Visual model - a class which sole purpose is to provide some visual representations in the SAMSON viewport. 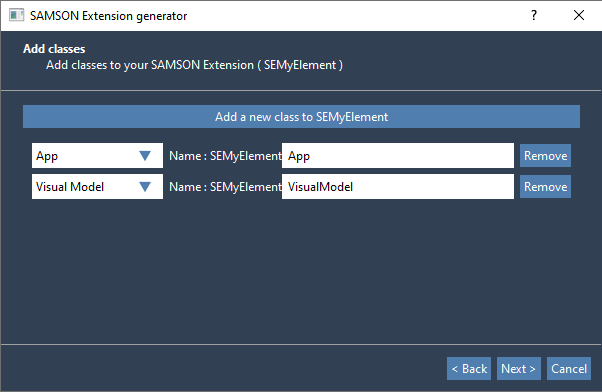 The SAMSON SDK Element Generator generates a SAMSON Element with a specific directory structure. In the Elements folder, you should now have two sub-folders (build and MyElement) and a CMakeLists.txt file. 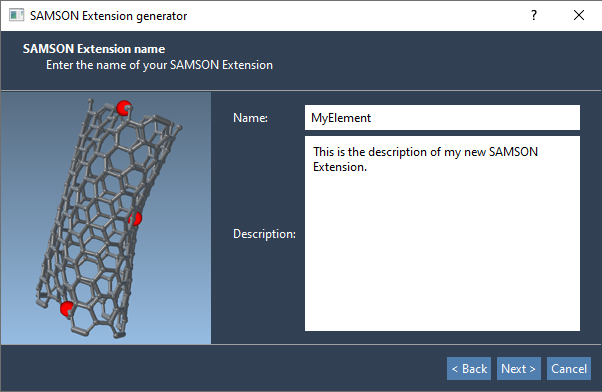 As the name indicates, the build folder is used to build your SAMSON Elements, while the MyElement folder contains the code generated by the Element Generator. The CMakeLists.txt file indicates to the CMake tool how to generate a project for your favorite development environment. 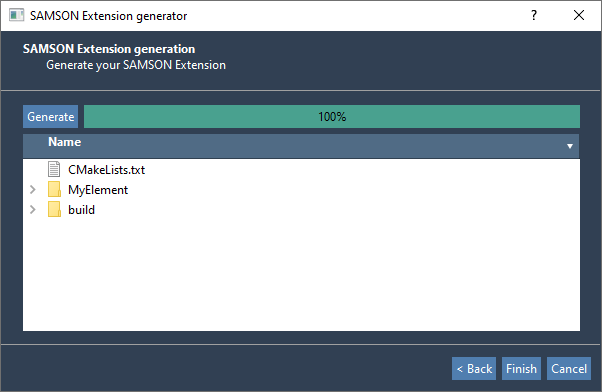 When you later generate new SAMSON Elements, they will be added in sub-folders in the Elements folder, and the CMakeLists.txt file will be automatically modified to include these new SAMSON Elements in the development project. Translations are performed thanks to Qt's internationalization mechanism, while icons are image files that you should replace in order to personalize your user interface. For example, the icon of an App is visible in the App menu and the App toolbar, while the icon of a Visual Model is visible in the title bar of its property window. The generated code contains comments to help you complete functions. 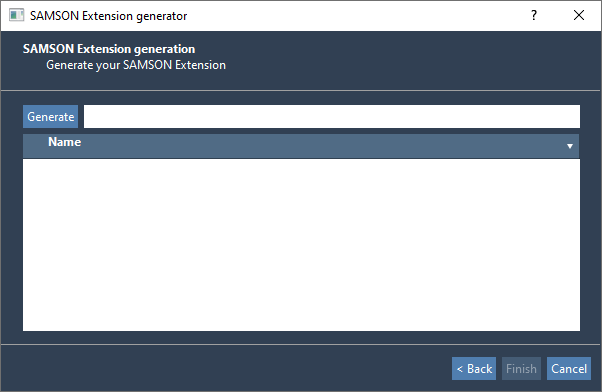 Search for "SAMSON Element generator pro tip" to determine which functions you may want to complete to achieve specific things. Now let's build a SAMSON Element.